Waiting for news about Rihanna's new album is like waiting for the first precious droplets of rare rain while you're trapped in a drought. We've gotten the release of singles like "American Oxygen" and "B*tch Better Have My Money" to tide us over, but we haven't gotten a release date, or a track list, or any real news besides the fact that Rihanna's next album will be released through her own company, and that she wants it to be perfect. Well, duh. However, the drought is slowly ending because, on Wednesday, Rihanna revealed the title of her next album, not to mention shared the album art, and it's every bit as cool and edgy as we've come to expect from the pop star. The album will be called Anti and, although we still don't have a release date, there are so many meanings that we can glean from the single word alone. (From the single prefix alone?) According to dictionary.com, as a noun, "anti" means "a person who is opposed to a particular practice, party, policy, action,etc," while, as a prefix, it means, "a prefix meaning 'against,' 'opposite of,' 'antiparticle of,' used in the formation of compound words" or "used freely in combination with elements of any origin (antibody; antifreeze)." That is a lot of meaning packed into a single word, and all of those definitions make me excited to see what Rihanna has in store for the album. After all, "American Oxygen" and "BBHMM" are two songs that are in such complete opposition to each other already that I can't even imagine what the rest of the album will sound like. Of course, we don't really have to speculate, because Rihanna opened her Instagram announcement by defining in her own words what the word means, and what it means in relation to her album. "A person who is opposed to a particular policy, activity, or idea. 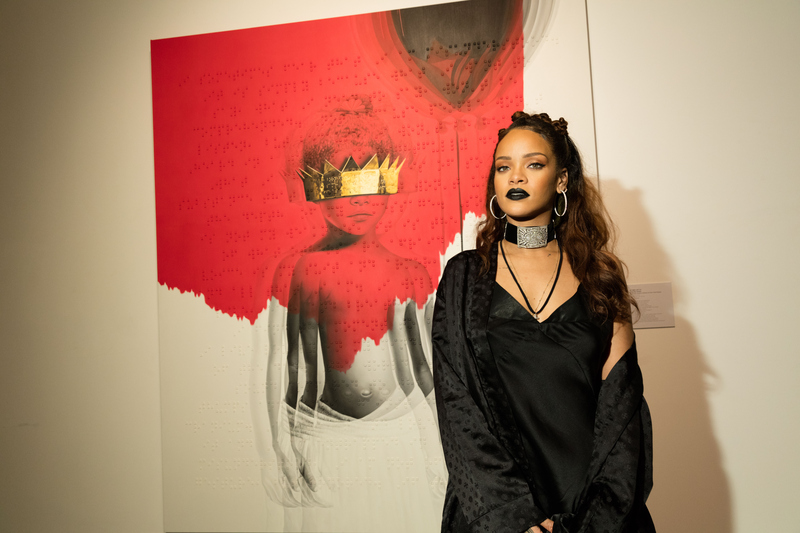 In her collaboration with Roy Nachum, Rihanna has changed the history of album art. By continuing to follow her own instincts, her work strives to make an impact by doing the very antithesis of what the public expects," she wrote. Did anyone else get chills? Because I got chills. Plus, get a look at this cover art, which is actually a picture of Rihanna as a child, holding a balloon and with a crown over her eyes set against red and white background. The cover art, in case you didn't get that from her preface, was designed by Roy Nachum, and was revealed in a Los Angeles gallery showing on Wednesday night. It's part of an entire collection that will elevate Anti from being simply an audio experience. Am I the only one getting some serious Kanye West vibes here? Or do I just associate anything with a crown with Kanye West? With Rihanna deciding #AntiR8 is going to be a multimedia experience rather than just an album, co-directing her own music video for "BBHMM," and releasing her album on her own terms through her own company, it's clear that, as she said so long ago in her single "Hard," "that Rihanna reign just won't let up." And, quite frankly, I don't want it to, because her business savvy and confidence to step forward and make these big power moves are what make her such a role model to everyone. You don't have to like Rihanna's music, and you certainly don't have to like Rihanna, but you have to admit that she has more than earned everyone's respect as an artist and business woman.